A flash of blue-gray darts in front of my vehicle just as I pass the visitor center. Maybe it’s a Blue Jay. As I exit the car and turn towards the Grace Dayton Wildflower garden, a small flock of Canada geese fly overhead in formation.Nature seems to be very active today. In addition to the apples and grapes that humans are harvesting; throughout the Arboretum, fruit is forming or ripening. 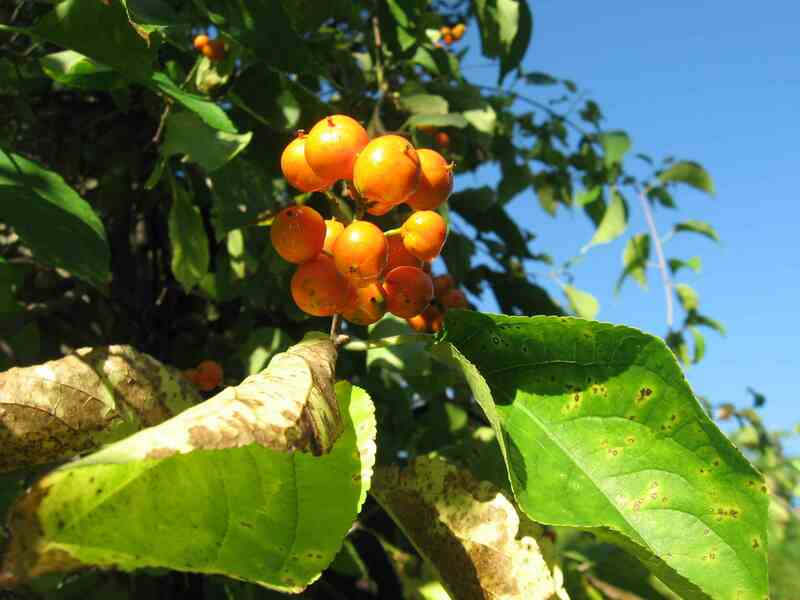 American Bittersweet fruit grows on the guideposts that flank the path into the woodland. The entwining vine cascades in graceful arcs; and the native, American species produces flowers and fruit on the ends of vine in contrast to the non-native invasive Asian species that sets fruit all along the vine. A thud on the ground catches my attention. Simultaneously, a few waving branches of foliage underscore the disturbance. I listen and look more carefully; and there is another. I find a number of broken plant stems and then a number of sprigs of leaves on the path. 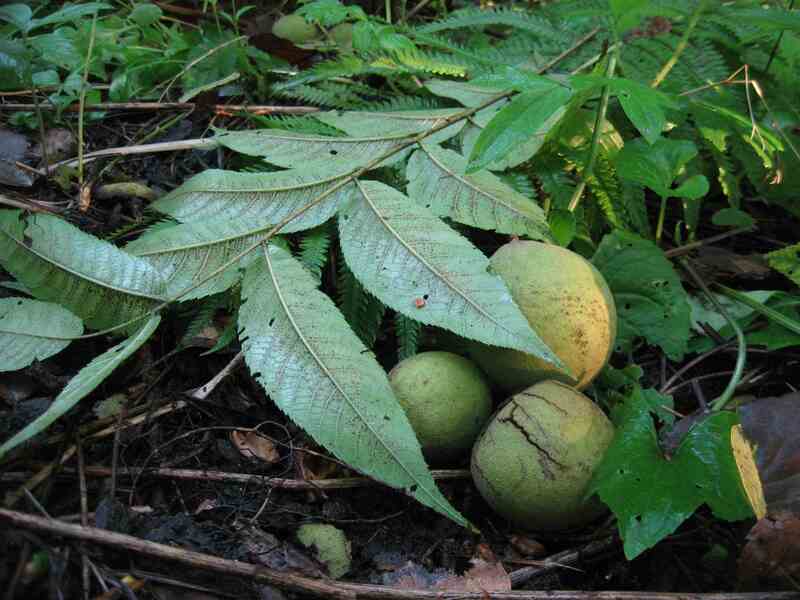 The compound leaves are Black Walnut. Overhead, there is a flurry of movement and I find the cause of all of this. A single squirrel is harvesting Black Walnut fruit. The animal cuts a fruit from its branch and the fruit drops. Over and over, the squirrel jumps from branch to branch; and repeats the motion. I wonder whether I should be afraid about being struck with one of the falling fruit. Looking down, I find dozens of fruit lying around plant stems and the Black Walnut leaves that are the casualties of the squirrel’s harvest. Just a year ago, I witnessed the next step of this harvest: squirrels collect the fruit one at a time. I don’t wait around today. As I exit the woodland on my way to the prairie, I notice the berries of False Solomon’s Seal. 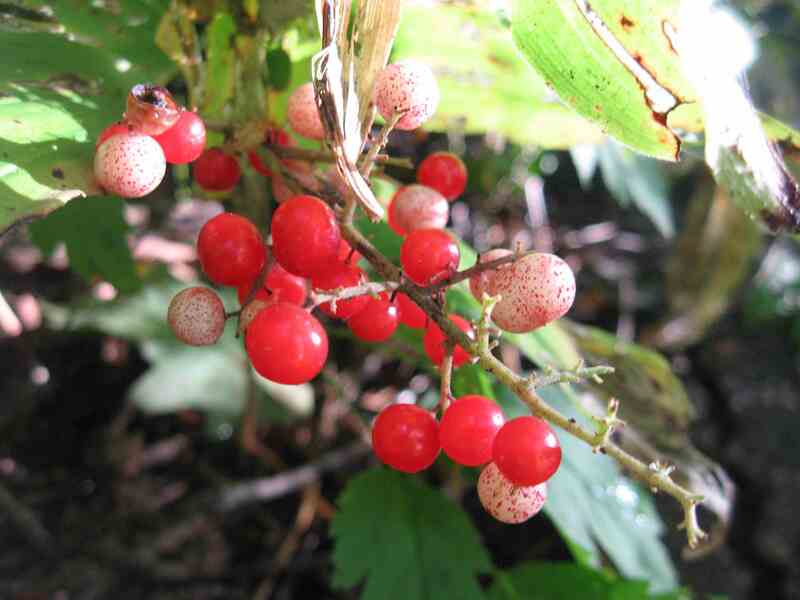 The fruit is ripening from the immature white berries through colorful speckled spheres to red and ripe. There is evidence of the fruit being harvested: empty stalks and berries half eaten. 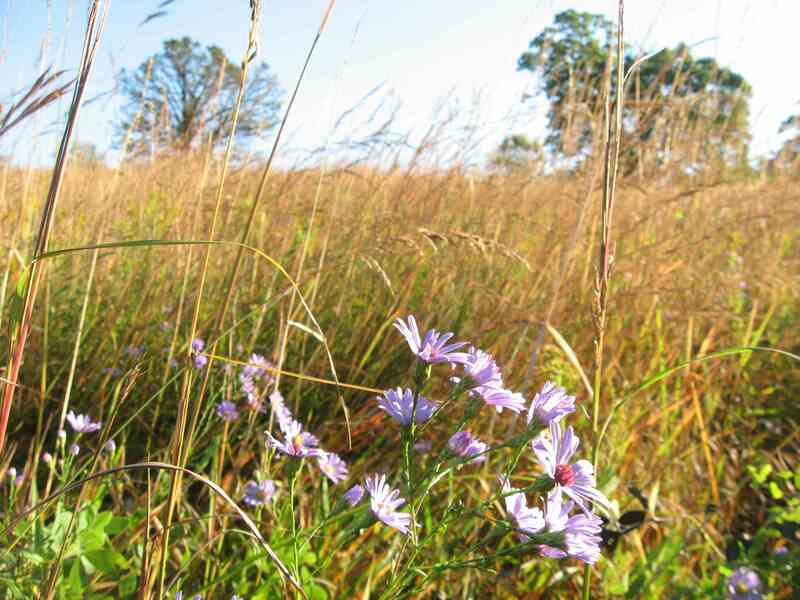 The prairie is as lush as the woodland. Grasses are tall. A number of asters add color: New England Aster, and a smaller one whose name is not memorable. In the Capen Display Garden and elsewhere, over this perfect growing season, nature has put on much biomass – foliage as well as fruit. On my return walk towards the car I notice more asters and the colorful leaves of Wolfberry, also called Snowberry (Symphoricarpos occidentalis). Along with sumac, this plant has begun changing color. Though the veins and some leaf edges remain green, the body of each leaf has turned crimson. Nature is ready for harvest….will you take part? Greg Lecker is a Minnesota Master Naturalist Volunteer.